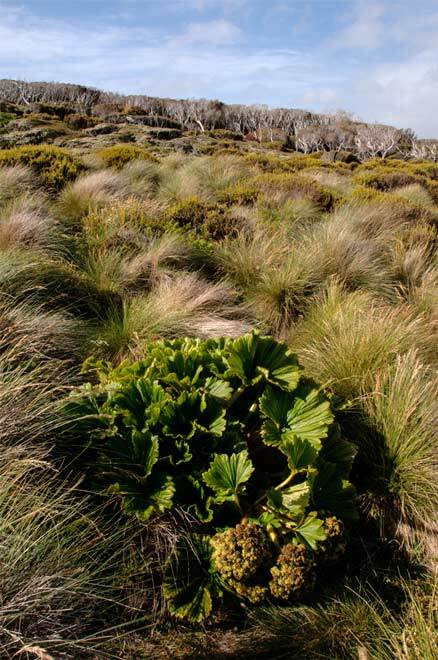 With its large rhubarb-like leaves, Stilbocarpa polaris was known as Macquarie Island cabbage, because it was eaten by sealers to ward off scurvy. It was also a staple food for castaways on the Auckland Islands. "And I'm wondering if anyone has considered utilizing the plants natural quality for this purpose of whitening teeth rather than the sometimes toxic or harmful chemicals within other products that are manufactured today? " Gregory, I had the exact same thought! I typed in Stilbocarpa and came across this website. It doesn't seem to me that anyone else out there uses this plant for natural teeth bleaching. I wish I could get my hands on one live plant and see if it really works. In the book "Island of The Lost", written by Joan Druett, published in 2007, she tells the castaway story of two ships, the "Grafton" and the "Invercauld" on Auckland Island. Her book is taken from the accounts of Captain Musgrave of the Grafton and either Captain George Delgarno or seaman Robert Holding of the Invercauld. This a well written account of these two shipwrecks. But what I found most intrigueing was the the information on the plants each of the groups found edible on the island and most likely helped to save their lives, specifically the Stilbocarpa polaris. It is written that the plant has a high content of a starch-storing sugary rhizome which has the side effect of bleaching the teeth white. And I'm wondering if anyone has considered utilizing the plants natural quality for this purpose of whitening teeth rather than the sometimes toxic or harmful chemicals within other products that are manufactured today? Worth looking into!